In today's world, an Independent Woman (single or married) is an individual who can make her own decisions pertaining to her mind, body and soul. We dedicate this to them. Stay strong emotionally, mentally, physically and spiritually. This book deals with two particular relationships and shows how verbal and non-verbal communication is important. The stories are pertinent in dealing with everyday life issues. Readers can pick up a copy on Amazon or Barnes&Noble. 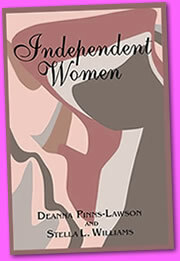 Deanna Pinns-Lawson is the co-author of Independent Women. She lives in Jamestown, North Carolina. She holds a BA degree from Rider University located in Lawrenceville, New Jersey. Ms. Lawson has assisted in churches, community development organizations, government agencies and scholarship foundations. Ms. Lawson received the Dr. Mildred Rice-Jordan Scholarship award at Rider University. She is the former Founder and CEO for the Single Parents Knowledge Scholarship Organization. Stella L. Williams holds both AA and BA degrees from Rider University located in Lawrenceville, New Jersey. Ms. Williams was recognized by the Rider University Women's Studies Colloquium Committee first in 1996 for her student paper entitled, "Folk Magic in the Short Stories of Hurston and Walker" and again in 1999 for her student paper entitled, "A Brief Look into the History of Nursing in the United States With a Look at the Journey of a New Jersey Nursing Assitant." Deanna and Stella are both currently working on individual projects including a new project Journey's of Independent Women, children's books and business ventures. Upon completing the Independent Women project, they continue to work in the field of writing as they further their skills and passion to help others improve their personal relationships. © 2019 Independent Women | All rights reserved.